Enjoy this tour, which explores the rich culture and vibe of New Orleans’ French Quarter - the most decadent district. You will be learning about its dark history, its legends of ghosts, vampires, and voodoo - deeply-rooted in its French culture. You will also be allowed to make a pit stop at any of the bars that the tour group passes to get your to-go cup refilled. Real paranormal equipment will be used during the tour for those interested in the paranormal aspect of the tour. Once you meet your guide at a designated meeting point, you can get ready for a fun cultural experience. You will walk through the magical streets of the Vieux Carre and visit historic and cultural landmarks. 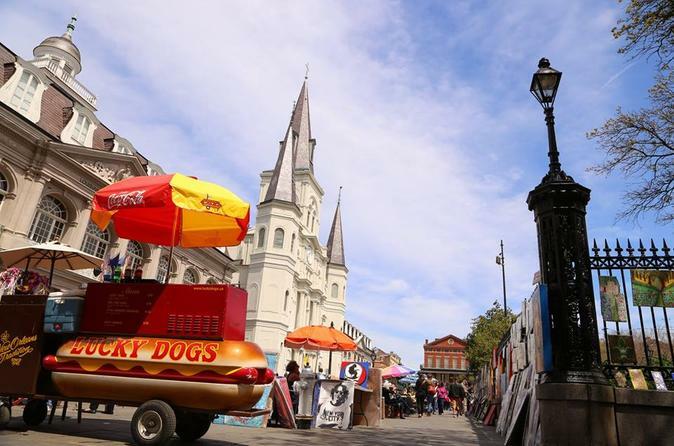 You will also visit the exact location where the Louisiana Purchase was signed in 1803, as well as the famous St Louis Cathedral in Jackson Square and many more places that played a vital role in New Orleans history. You will discover where to find the most predictable ghost named Julie, and visit the most haunted house in the city as well as multiple locations where vampires have been seen (the police have documented sightings of them on a regular basis). You will also learn about the origins of voodoo in New Orleans, hear about the Voodoo Queen Marie Laveau, and locations where Voodoo ceremonies were held. Apart from the history and the paranormal, you will also explore its bars. The French Quarter has over 200 bars! While not going inside the bars, you can feel free to go inside by yourself and refill your to-go cup. Your tour guide will wait outside by the door. This tour is for all ages, some locations will allow children inside however some do not. Drinks are not included in the price of the ticket.